We sped past Lovelock, made Winnemucca and the Model T on Sunday evening and finished our business there by noon on Monday. With some time to spare before we were due in Battle Mountain, we drove to Paradise. 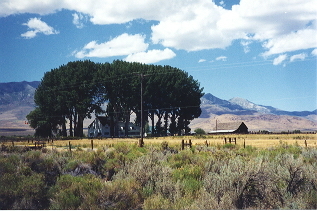 Paradise Valley is about 45 minutes north of Winnemucca via US-95 and Nevada 290. 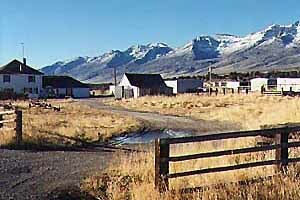 It’s a quiet and supremely photogenic community dating from the 1860s when it was a supply point for the mines in the nearby mountains and called Paradise City. It’s almost purely agricultural now, except for an occasional tourist lured by the name. Wander the quiet streets of the serene little town for a half hour as we did, and the name seems to fit perfectly. magnificent 3-story ranch house with a broad apron of rich green lawn and a shady canopy of magnificent cottonwoods. There are seven rooms and suites at $40 – $95. In Battle Mountain we spent a pleasant hour with Shar Peterson at the recently-revitalized Chamber of Commerce. She showed us the massive old cookhouse from the 25 ranch which has been moved into town to await restoration as the local museum. 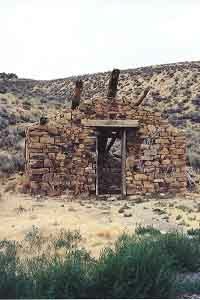 It’s built of railroad ties in the good old Nevada way, a most imposing structure. 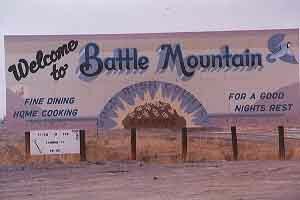 But the big buzz in Battle Mountain is about the 2001 World Human Powered Speed Challenge scheduled for October. Sam Whittingham set the world record at last year’s event by pedaling 72.75 mph on a 200 meter stretch of Nevada 305 south of town. At least three teams of the world’s fastest bikes and riders (including Olympic cycling gold medallist Jason Queally from England) will compete this year, and a new world’s record is a strong possibility. Details: here. At Elko we stayed at the Hilton. 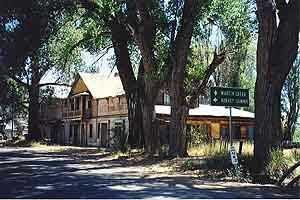 A Hilton in Elko! But yes, it’s out on the fashionable east end — oh, wait, that’s London — and has no casino action to electrify the atmosphere. It’s internet friendly, a definite plus for business travelers. 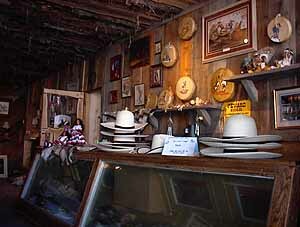 Elko provided our big shopping experience: Robin bought a braided horsehair belt at Capriola’s, and a hat at Anacabe’s. And the best lunch of the trip: the rueben sandwich at Tew Joe’s Deli on Yuppie Row (5th Street, across from the Commercial) — just right! Wells and then south on US-93, pausing briefly at the Ruby Mountain Brewery on our way to Ely. This is Nevada’s only licensed brewery (our other beermakers can only serve on site), producing a widely-distributed amber ale and heifeweisen, with other special recipes and seasonal offerings from time to time. The current special is a Vienna-Style Lager which is absolutely marvelous — silky smooth and richly flavored. You can get Ruby Mountain beer at Raley’s and Trader Joe’s, and at enlightened and forward thinking saloons around the state. Coming down from the north at night you can see McGill’s and Ely’s lights ahead for many more miles than you think possible, so clear and open and dark is the Steptoe Valley after sundown. We stayed at the Hotel Nevada & Gambling Hall, once Nevada’s tallest building, and still one of its great hotels. From the limo parked outside to the murals in the upstairs hallways, the hotel reflects the devotion to detail that is the hallmark of great hotels. The rooms have been upgraded, some of them made quite luxurious and named for the celebrity guests who have stayed at the hotel in years past, from Tennessee Ernie Ford to Stephen King. I’ll share a secret with you: make your reservation in advance and ask for room #512. It’s the most elegant of the upgraded rooms, outfitted for the use of the former manager of the hotel. And it’s no longer necessary to ask for a room far from the elevator, as the new $100,000 model is smooth as silk and just a whisper away from utter silence. No more little jounce at the end of the ride, either. If you want the utmost in luxury and self-indulgence, take the 6th floor Kennecott Suite — two bedrooms, three tvs and a spa for $85 a night. 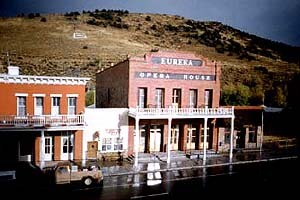 From Ely we turned west again and made the 77 miles to Eureka with the enjoyable company of “Traveling America’s Loneliest Road, A Geologic and Natural History Tour through Nevada along U.S. Highway 50.” We’d bought it from the Nevada Books section at the Ely Gift Boutique, and it served us as a knowledgeable guide to the interesting landmarks as we drove along. This eloquent structure endures between Ely and Eureka. The best dinner of the trip was at the Eureka Owl Club. The double-cut lamb chops were superb, and the unexpectedly sophisticated wine list yielded a nice petite syrah to go with them. 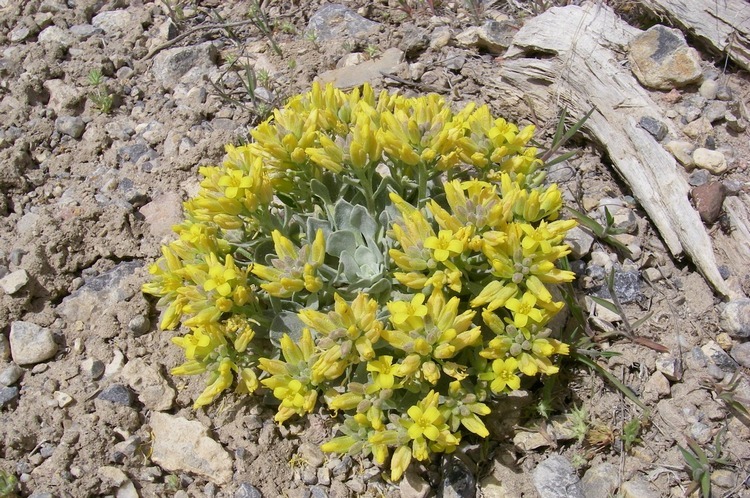 Actually, the wine list should not be all that surprising, as proprietor Ron Carrion combines his love for the sagebrush with an expert knowledge of fine wines. Check out his new website here and sign his guestbook. The Jackson House farther up Main Street is also excellent, and the Deli, on the southeastern side of town a block off Main Street, is an attractive choice for lunch. Eureka has emerged as a culinary bright spot on the Nevada map. Another fascinating Eureka attraction is the art on exhibit at the Eureka Opera House. Wally Cuchine was gracious enough to give us a guided tour, but these Nevada pieces are eloquent enough to speak for themselves. Don’t miss seeing them when you’re in Eureka. We had to glide through Austin with only a brief stop at Jim Gramm’s excellent new Trading Post at 96 Main Street (antiques and collectibles, including antique bottles), on through Fallon, Silver Springs and Dayton to home. Glad to be back, eager to go again. I’m thinking east on 50 to Fallon, get some pix and info updates and then go on to Middlegate and south on 361 to Gabbs for the night. Then over to Berlin and Ione and Austin. Then Fallon again and home. . . .
We’ll see . . . any suggestions?